Item #IGM-S3032612026: 3 1/8" Cloisonne rabbit. Item #CC-S3022312011: 5 1/2" long green Cloisonne dinosaur with 1/2" tall wooden stand. 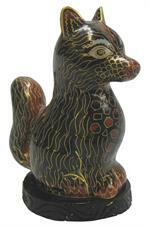 Item #IGM-S3032612005: 3 1/2" tall Cloisonne fox with 3/8" tall wooden stand in assorted colors. 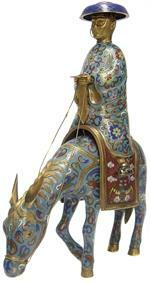 Item #CL-400: 11"x15" Cloisonne rider on horse. Rider has a removable hat and is realistically depicted with a mustache and hands holding reins. The horse has gold tone ears, mane and tail. Item #CL-169: 1.25"x2"x1.75" Cloisonne monkey with white, brown or black background and multi-color floral design on a carved wooden base. This playful monkey is captured in Cloisonné with his back foot scratching his ear. Item #TGD-274: 2x1.25" tall 18Kt. Yellow Gold rabbit pendant enhancer/brooch with round white Diamonds and natural champagne color Diamonds of 6.74 Cts. TW. 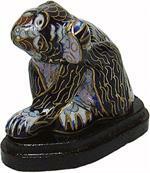 Item #GS-258: .5"x3.5" tall dark Blue Lapis Lazuli Beauty with Rabbit and Bouquet. Very slight Gray mottling and Pyrite inclusions. Mounted on .75" tall carved wood stand. 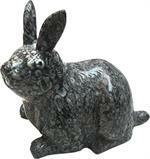 Item #GS-934: 1.125"x2.375"x1.25" tall Lapis Lazuli Rabbit with Pyrite specks. 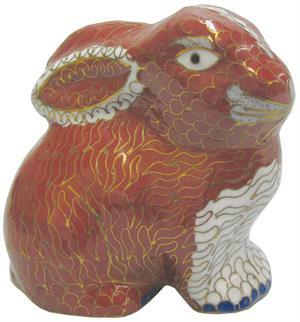 Item #GS-952: 2.25"x1.25"x1.3" tall rich Cobalt Blue Lapis Lazuli Rabbit with natural Calcite mottling. 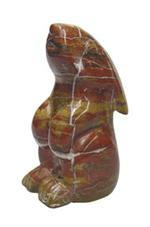 Item #GS-2151: 5" tall, Red & Yellow Jasper Rabbit. 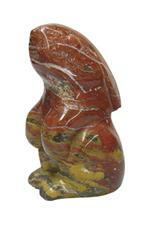 Item #GS-2152: 4.25" tall, Red & Yellow Jasper Rabbit. 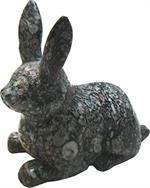 Item GS-2159: 2.75"x6.5"x2.75" tall Rhodonite Rabbit. Approximately 1 1/8" long; Assorted natural colors; 1,000 pieces. Approximately 1 1/8" long; Assorted natural colors; 100 pieces. Approximately 1 1/8" long; Assorted natural colors; 12 pieces.